One liner review: A Great premise that leads to a somewhat Fun film, but mostly in a b Movie, intentionally corny kind of way. No director has ever strived to be more like the great Alfered hitchcock than brian depalma. And that includes gus van sant, who made a shot by shot replica of hitchcock’s movie “Psyhco.” But depalma is different. He doesn’t copy whole movies from the master, but tries to make his films in the same style that Hitch might have used if he was alive today. He uses point of view shots where we see exactly what a character sees to such an exreme extent that the character’s arms sometime move in front of us, pushing open a door or something so that we know that in this moment, we actually are the character. That kind of style is what depalma employs in movies like this one or dressed to kill (which took from psycho in a very different way than van sant’s remake). Depalma also did it with his movies Obsession and body double. And while taking someone else’s style isn’t usually the best idea, for depalma, he kind of makes it work. After all, he is a pretty talented filmmaker himself. This is the guy who made Scarface and the untouchables and carlito’s way and carrie. He knows what he’s doing. And who better to copy than the master, mr. hitchcock himself? Snake eyes is a movie with a very straight forward plot and a treatment of it that is remeniscent of the classic kirosawa film rashomon. There’s a murder and then a whole bunch of perspectives and ideas about what might have happened. the movie doesn’t blatantly rip off rashomon like many other movies have (Such as vantage point), but it uses the ideas to add to its own ideas instead. So we get a terrfic moment where we see the boxer’s point of view of a scene that we saw earlier when it was taken from nicholas cage’s point of view. When we were with cage earlier, we stayed outside of a room and only ran in at the end. Now, with the boxer, we see what was happening inside the room until cage ran in. That kind of touch and stylistic move is pretty cool. But the initial idea and the conspiracy are all a little too simple. I like the assassination at a boxing match idea and the keeping all of the witnesses inside the casino and the giant rain storm outside (Which is also a staple of rashomon as the characters stay under the roof of a temple, out of the rain). The rain storm murder mystery-all in one night movie is a classic formula that has worked again and again in movies like clue and identity. Depalma knows the right building blocks, such as this, and he has them on hand. But the problem is the story. It’s weak. The conspiracy is very elementary and involves mostly characters we don’t know or care about. There is, of course, one major surprise about who a bad guy is, but it really seems like the whole movie is built around that surprise as if it will be enough to carry the rest of the film. The truth is, that surprise should have been just the beginning. After that, a whole web of twists and deception should have unraveled. But instead, the surprise is used as the be all and end all, and that’s a terrible move. The other problem with the movie is overacting. 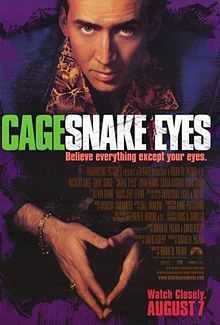 Cage is supposed to be an amoral, corrupt cop who takes money and probably does drugs, but at least knows the right thing to do. When he finds out about the murder, he suddenly refuses to go along with it and has to do the right thing. As someone points out to him, “You’re the guy who always takes the money, so do what you do and take the money and walk away.” And maybe it’s hearing that about himself that makes cage want to prove this theory about him wrong, but it all seems just a little too simple. 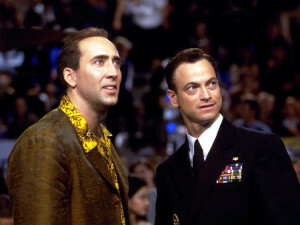 Cage’s character, rick santoro, in this movie is like a cardboard cutout of a real person. He is very wired and high-strung and he’s probably on a lot of cocaine, but for some reason the movie doesn’t show that. I like the idea of the main character being an amoralistic corrupt cop, a true antihero, but for some reason this movie doesn’t fully commit to that idea. It seems like the worst thing santorro does is place bets and chase down low lifes for money. But he doesn’t do anything extreme, and that’s what separates his character here from his character in the movie Bad Lieutenant: Port of Call, new Orleans. That film went all the way, including drugs and extreme corruption. This movie does not. It wants cage to seem like a dirty cop, but at the same time it doesn’t want to go to far. It wants to play in the pg-13 territory when the r territory would have been a whole lot more interesting. And aside from cage, the movie is really not well cast at all. The other actors in here are gary sinise (where has he been since forest gump?) and Carla gugino. This is A brian depalma movie. The great actors should be running to get involved. Look at the cast james mangold got for copland. And that was before people knew who we was. For depalma not to get a better cast than this, people had to know the script was a stinker. Another problem with the movie is the limited amount of action. And by limited, I mean pretty much none. DePalma didn’t set out to make an action movie here, he set out to make a thriller. And I get that. But when the mystery is all one note and that one note is revealed with a solid chunk of the movie still left, than what are you saving for the final portions of the movie? And how are you ensuring that the movie stays interesting? At one point the characters go up to the hotel rooms on one of the floors and it’s a nice breath to be away from the boxing arena and the casino for a little bit. But nothing that interesting happens up here. There should have at least been a shoot out in the hallway. Snake eyes is a movie with an interesting premise that just doesn’t know where to take things after that. I’ll buy the character and the situation, but what I’m really wondering is why this plot had so litTle momentum.One thing depalma did not learn from hitchcock is how to drag a mystery out and keep the audience wondering. He should have studied read window. Snake eyes has redeeming qualties in that if you turn off your mind and just watch it for fun, it is certainly well-made. But when you actually think about it, you realize that there are a whole lot of things that could have been handled much better.